Marched about 8 miles to the foot of the mountain. found the road much blockaded which stoped [sic] us for the night. The next day we moved camp to the base of the mountain and fatigue parties were sent out to remove the blockade of trees that had been felled by the enemy. The men worked with energy and the road was rapidly cleared of obstructions. The men worked with energy and the road was rapidly cleared of obstructions. Our guards at the top of the mountain had two little encounters with squads of cavalry during the day, resulting in the capture of some very fine horses and weapons by our fellows. While lost for a moment in admiration of the scene, and forgetful of the rude business which brought them thither, the little battalion was startled by four or five rifle shots fired in quick succession, a few rods down the Southern slope. In a moment the men were in line, and moving down the path toward the scene of disturbance. The alarm was soon explained. In the early dawn a small squad of Rebel cavalry had left the camp in Powell's Valley and rode up to the summit of the Gap, where they had been accustomed to keep guard during the day. As they approached the top they were fired upon by the picket thrown out by Col. Pardee on his arrival the night before. Three of the cavalry-men rolled off from their horses and scrambled into the bushes, leaving their horses, their hats and their weapons, which were captured. Two of the five, who were riding some distance in the rear, escaped and reported in the camp below that they had encountered a few Kentucky bushwhackers on the mountain. Even then there was no suspicion among the Confederates in Powell's Valley that Morgan's army had left its position at Cumberland Ford and was seeking to force a passage into Tennessee. Toward noon another squad of cavalry from Powell's Valley was seen slowly coming up the pass. Twenty or thirty men were posted in the bushes near the path, a few rods below the summit* while the main body lay in wait behind the crest of the hill. The plan was to draw the horsemen into a trap and capture the entire party. They came cautiously along and the game seemed likely to succeed, when, just as they were passing the squad concealed in the bushes, Private Shattuck of Company "A," Forty-Second Ohio, seeing a good chance for a shot, fired without orders, and unmasked the trap. The cavalry-men wheeled, lay close to their horses, and spurred headlong down the hill. A volley was sent after them, killing one horse and wounding three men, but all managed to escape, and from that time they kept carefully out of range of Wilson's Gap. Mason quotation taken from The Forty-Second Ohio Infantry - A History of the Organization and Services of That Regiment In the War of the Rebellion, 1876 - F. H. Mason, late Private of Company A - Cobb, Andrews & Co., Publishers. 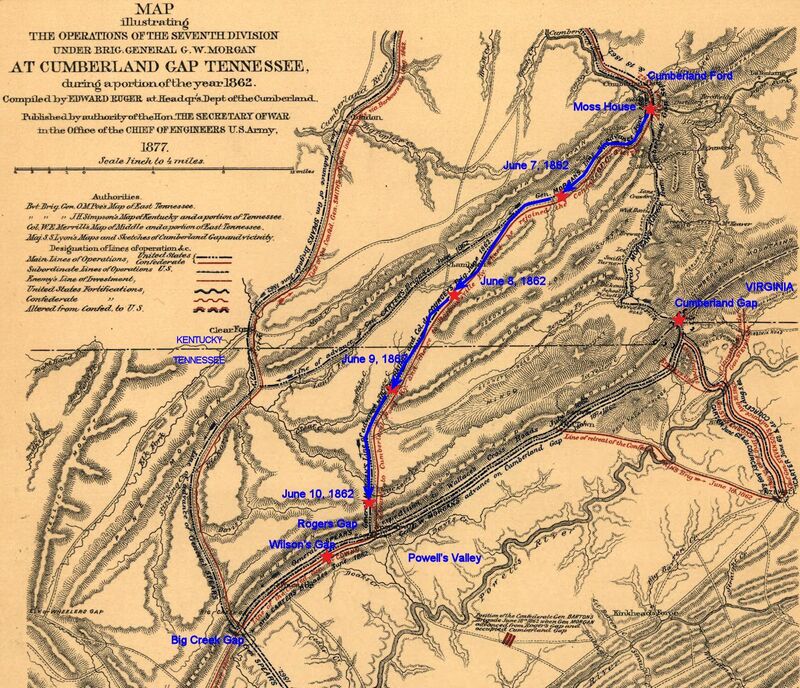 Military map showing the approximate route of the 16th Ohio from its camp at The Moss House, near Cumberland Ford, Kentucky, southwest along the Log Mountains on June 7, arriving at the foot of Roger's Gap on June 10, 1862.